Thrifty and Frugal Living: $200 Target Gift Card Giveaway! I have teamed up with another group of bloggers for another big giveaway! 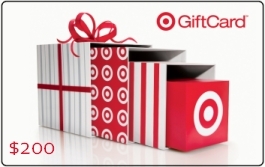 This time we are giving away a $200 Target gift card! This gift card is sure to come in handy with Christmas shopping. To enter, simply follow each of us on Facebook and Twitter using the Rafflecopter form below. Giveaway starts 11/11 at 12:00 am EST and ends 11/25 at 11:59 pm EST. This giveaway is open to US residents only. Don't forget that there are several daily entry opportunities as well, so bookmark this giveaway and come back every day to claim yours! Good luck! love to shop at target,it would help a lot to win this amazing prize.